The 2015-16 season will see Orion performing with the Iceland Symphony, among others, and in collaborative projects including those with the Pacifica Quartet and with Cho-Liang Lin and the New Orford String Quartet in a performance of the Chausson Concerto for piano, violin, and string quartet. The 2014-15 season featured Orion’s third performance with the Chicago Symphony Orchestra as well as a North American tour with the world-famous Salzburg Marionette Theater in an enhanced piano recital of Debussy’s La Boîte à Joujoux. In 2015 Naxos released his recording of Christopher Rouse’s Seeing – a major commission Orion debuted with the Albany Symphony – and in 2012 he released a recital album of Dvorak, Prokofiev, and Bartok. That same year he also spearheaded a recording project of the complete Gershwin works for piano and orchestra with his longtime collaborators the Buffalo Philharmonic and JoAnn Falletta. The 2013-14 season featured Orion with orchestras around North America, including the Cleveland, Milwaukee, and Vancouver Symphonies, and the 2012-13 season saw Weiss in repeat engagements with the Baltimore Symphony and New World Symphony. Also known for his affinity and enthusiasm for chamber music, Weiss performs regularly with his wife, the pianist Anna Polonsky, the violinists James Ehnes and Arnaud Sussman, and cellist Julie Albers, as well as ensembles including the Pacifica Quartet. 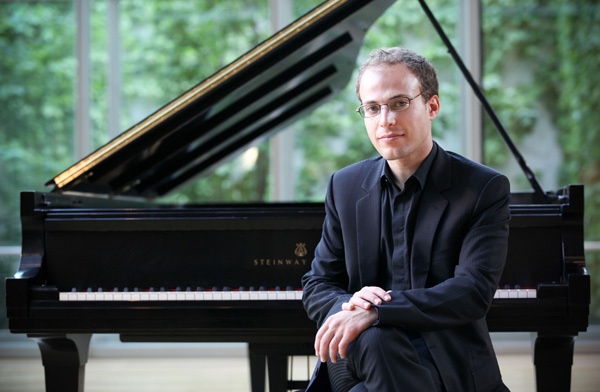 As a recitalist and chamber musician, Weiss has appeared across the U.S. at venues and festivals including Lincoln Center, the Ravinia Festival, Sheldon Concert Hall, the Seattle Chamber Music Festival, La Jolla Music Society SummerFest, Chamber Music Northwest, the Bard Music Festival, the Bridgehampton Chamber Music Festival, the Kennedy Center, and Spivey Hall. He won the 2005 William Petschek Recital Award at Juilliard, and made his New York recital debut at Alice Tully Hall that April. Also in 2005 he made his European debut in a recital at the Musée du Louvre in Paris. He was a member of the Chamber Music Society Two program of the Chamber Music Society of Lincoln Center from 2002-2004, which included his appearance in the opening concert of the Society’s 2002-2003 season at Alice Tully Hall performing Ravel’s La Valse with pianist Shai Wosner.